The film “Baby Driver”, features a Subaru WRX, and the driving scenes were real, not computer generated imagery. Does your favorite car movie use CGI? The 2006 Subaru WRX is a performance car that can be pushed hard because of its rally-bred heritage. That’s what makers of the film, Baby Driver, did for real when filming the movie. The new action film from Sony and Writer and Director Edgar Wright, didn’t rely on CGI (computer generated imagery) to do the chase scenes. WRX and the other get-away cars did their own work. Movies like Fast and Furious, rely heavily on CGI, but the get-away scenes in Baby Driver were all real says the stunt driver in an interview with CarBuzz. The Subaru WRX driven by star Ansel Elgort the conflicted getaway driver, weren’t actually driven by him, but a stunt man did put the WRX to work on the streets of Atlanta during the filming. The 2006 Subaru WRX and other get-away cars and trucks in the movie were driven by stunt driver Jeremy Fry. 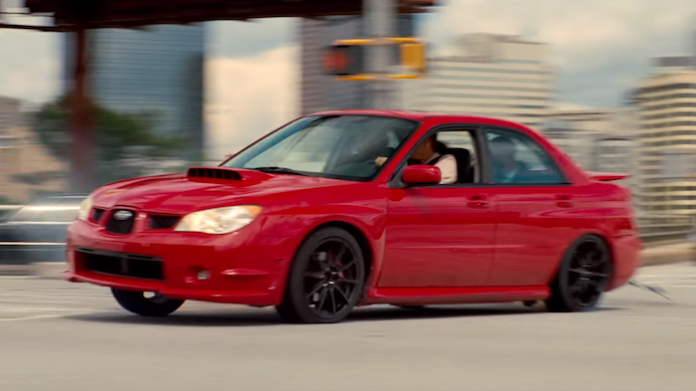 In the movie, they used three different 2006 Subaru Impreza WRXs for the filming. One was a stock WRX STI with the wing removed, one was a modified WRX with over 320hp and other powertrain upgrades, and a third was an automatic transmission model with a camera on top converted to rear-wheel-drive. Whichever model they used, it’s refreshing to know what you are seeing on the big screen is real in Baby Driver. The Subaru gets some good action in the opening scene as Elgort, who plays the title character “Baby”, a getaway driver for his crooked boss, easily outruns the cops in his bright, red 2006 Subaru Impreza WRX. Fan Poll: We would chose Steve McQueen’s Mustang in ‘Bullitt’ and the Mini-Cooper in ‘The Italian Job as our favorite car movies. What’s yours?